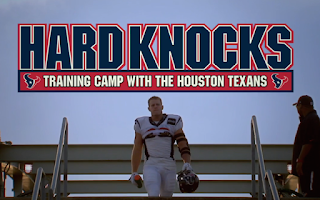 HOUSTON -- The Texans will be the next subject of HBO's documentary series "Hard Knocks." This marks the first time the Texans are the subject of the show, produced by NFL Films, which chronicles training camp. Though they're new to being featured, Houston and star defensive end J.J. Wattmade a cameo on the show last season when the Atlanta Falcons, last year's headliners, traveled to Houston for joint training camp practices.Since its inception in 2001, the show has featured the Ravens, Chiefs, Jets, Dolphins and Falcons once each. The Cowboys and the Bengals have each been featured twice. The Texans are the first team in the AFC South to be featured on the HBO show. This year, the Texans will travel to New Orleans for joint training camp practices. NFL Films supervising producer Ken Rodgers said the cameras will join the Texans in Louisiana, but the Saints will not be part of the story line. Teams have the right to refuse the show if they have a new head coach, have been to the playoffs in the past two seasons or if they have been the subject of the show in the past 10 years. The Texans were among nine teams that did not fit any of that criteria. In the secretive world of the NFL, teams have shied away from the show out of concern for revealing too much. "We trust them implicitly to handle our preparation," Texans general manager Rick Smith said. "You go to training camp for two primary reasons, to get your football team ready for the season and to figure out who the best 53 men are to accomplish your goals. We feel like that by no stretch of the imagination is this going to prevent us from doing that. We feel very comfortable." Texans coach Bill O'Brien was not made available to media on Wednesday, but has been part of a behind-the-scenes show before. In 2013, Penn State was the subject of ESPN's "Training Days" series. "The main thing that were going to emphasize is this is something that is not going to be a distraction for us," McNair said. "We're going to go ahead and carry out our duties as we normally would. I think after a day or two everybody will be used to having the people around and it will be practice and business as usual. I think that it will give everybody in the country an opportunity to get to know our coach better. He's a great coach, great personality, and I think people will see that."